Omega Stabilized Rice Bran is a convenient, stabilized source of high energy and Vitamin E supplement for the diets of your show and performance horses, as well as your young growing horses. The dietary fat in Omega Stabilized Rice Bran functions as a calorie-rich supplement that helps horses meet their energy requirements. It also serves as an additional energy source that does not require feeding more grain in the diet. The additional calories provided by Omega Stabilized Rice Bran can increase the number of calories per pound of the diet. Therefore, it can replace the amount of grain that must be fed to maintain top condition – reducing the chance of colic associated with overfeeding grain. Omega Stabilized Rice Bran is an excellent source of easily-digestible, palatable vegetable fat (without the mess of adding vegetable oil or other high-fat supplements many horses don’t like), Vitamin E, B-Complex Vitamins, essential amino acids. All natural (no chemical additives or preservatives). Your horse gets 2.25 times the energy per/unit weight compared to carbohydrates. 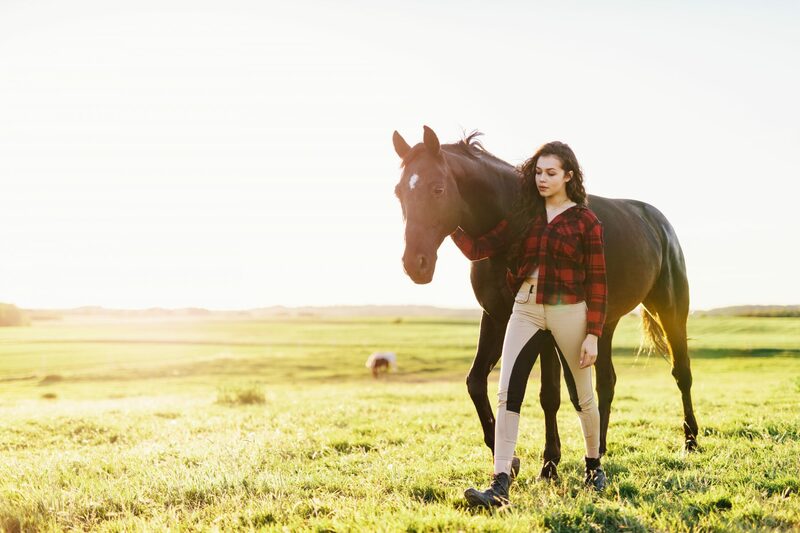 Omega Stabilized Rice Bran is also naturally high in Vitamin E – which is likely to be deficient in the diets of horses that are working very hard or are experiencing high-stress conditions such as training, transportation or harsh environmental conditions. Also Vitamin E is required when horses are fed increased fat levels. The stabilization of Omega Stabilized Rice Bran reduces the lipase activity and prevents the rice bran from becoming rancid – without destroying the nutritional value. We’ve never compromised the quality of our products and we never will. Crude Protein, 16.21 % Min. Crude Fat, 21.46 % Min. Mono Unsaturated Fat, 42.0 % Min. Polyunsaturated Fat, 38.0 % Min. Crude Fiber, 4.89 % Max. Vitamin E,. 440.0 IU/lb. Min. Digestible Energy = 2,400 Kcal/lb. Feed 2 lbs. per head/day for performance. One year shelf life at room temperature with no signs of rancidity or loss of nutritional value. Best if stored in a cool, dry place to protect against oxidation. Keep out of direct light. Omega Stabilized Rice Bran is sold in 50 lb. (22.68kg) bags – approximately 50 daily servings. I see your rice bran does not contain added calcium, so how much beet pulp could I feed per pound of rice bran to balance the cal/phos ratio? While it seems to be a basic question you are asking, there are many layers to be considered. It is not just about balancing rice bran and beet pulp – it is about balancing the horses COMPLETE feed intake to ensure proper nutrition. We recommend that it may be wise for you to take your horse’s whole diet into consideration to ensure proper balanced feed intake; i.e. the sort of forage/hay you are feeding – is it grass or alfalfa (which is high in calcium) – or are you feeding a concentrate or grain. You would take the calcium and phosphorus content foudn on the feed tag of the bag and do basic feed math to ensure proper balanced feed intake. Can you please tell me who (or what country) supplies your rice bran? Have you tested it for melamines? I will stop feeding it until I hear from you. Faithful customer of Omega Stabilized Rice Bran. 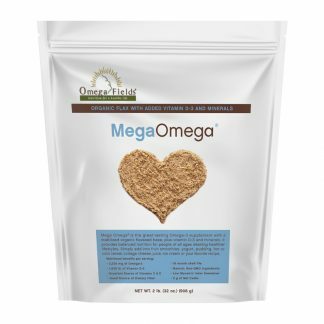 Regarding your concern about the Omega Stabilized Rice Bran you purchase from Omega Fields –We take great pride in being able to assure our customers that all Omega Fields’ products are all natural, without added chemicals, to provide good health and well-being for people and their animals. We contacted our stabilized rice bran provider — and are very pleased to report that the company only gets rice bran from domestic sources grown in the United States, primarily the West and Central Southern states. They do not source from China. We were assured, as well, that the stabilized rice bran is NOTan isolate or a protein fraction of rice — as was the rice bran protein ingredient (with melamine added) that is causing so many unnecessary health problems. Please be assured that we value our customers and will make every effort to make sure that your experience with our products, our shopping cart system, and our people is the best we can offer. 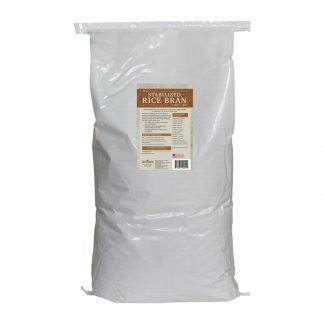 I recently ordered a bag of your rice bran. I should have a food scale but I don't. Can you tell me the approximate volume of Omega Stabilized Rice Bran that equals one pound? One pound of Omega Stabilized Rice Bran equals 3 rounded measuring cups or 4 level measuring cups (standard measuring cups). I am writing to ask whether your rice bran product has always been without added calcium? Yes, our Omega Stabilized Rice Bran has always been without added calcium. What would be the ratio to feed the Omega Horseshine to the Omega Stabilized Rice Bran to keep the Omega's in balance? If you use human grade rice bran (20% fat) on average(please note that our Omega Rice Bran is 20%), then you have to feed essentially 1.4 times that amount in flax (horseshine specifically) to get to a 4:1 ratio of Omega 3:6. If you use animal grade rice bran the fat percentage is lower (at least according to my NRC) at around 15% then you would need to feed about a one to one ratio. Rice bran is 34.4% n-6 fatty acids, so will contribute a fair amount. Typically rice bran is also fed in much greater amounts than Horseshine would be, as you are usually using it to put weight on a horse. 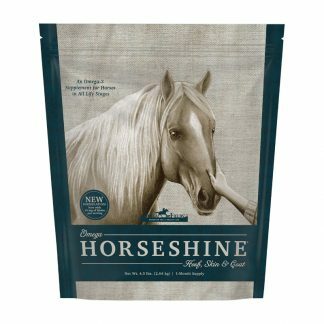 If you want to drop that goal to 3:1, similar to Horseshine itself, than feed equivalent amounts of Horseshine and rice bran human grade or .79 times the amount of rice bran in Horseshine if it is animal grade. Now, here is the kicker. That is ignoring the contribution of n-6 that horseshine provides as well. Remember, if I add more horseshine I will be adding more n-6 simultaneously. I would once again caution that you need to look at the complete diet. Horse consume far more of the diet in the form of forage than they do concentrate. But if you are looking at only these two components, that would be my suggestion. What is the sugar content of Omega Stabilized Rice Bran? Below please find an in-depth analysis provided by Alli Kuhl, Omega Fields’ Resident Equine Expert, concerning the different Carbohydrate Fractions (CHO) and their importance in evaluating equine rations. She pulled information together from the web and from her college equine nutrition class notes. We hope you will find this information very useful. We have also provided Bottom Line comments as well. Neutral Detergent Fiber (NDF) is a measurement of the Insoluble Fiber in a ration. NDF includes hemicellulose, cellulose, ligno-cellulose, and lignin. These components of NDF are resistant to digestion by enzymatic hydrolysis but may be fermented to varying degrees by the microorganisms in the hindgut of the horse. NDF is an indicator of the total bulk in the ration and can thus be used as an indicator of intake potential. Acid Detergent Fiber (ADF) is a sub-component of NDF containing the cellulose, ligno-cellulose, and lignin portions. Acid Detergent Fiber is less digestible (fermentable) than NDF. Because of the relationship between digestibility and available energy in a feedstuff, the ADF percentage of forages or other fiber sources is often used to predict energy content. The lower the ADF the higher the energy potential of the feed. Neutral Detergent Soluble Fiber (NDSF) is not a sub-component of either ADF or NDF. In laboratory procedures the NDSF is a sub-component of Non-Fiber Carbohydrates (discussed below). This fiber fraction, however, is rapidly fermented in the hindgut of the horses and does not result in excessive acid production or subsequent digestive disturbances, as does the fermentation of non-fibrous carbohydrates (starch, sugar). 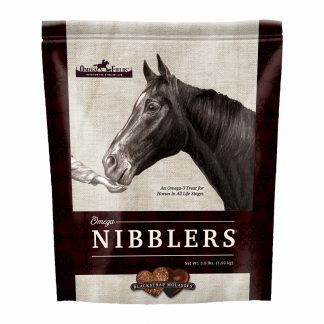 Therefore, feedstuffs high in NDSF (i.e., soy hulls, beet pulp, rice bran) can be incorporated into equine rations to compensate for low energy, poor quality forages while providing additional energy in the form of fiber. Additionally, feedstuffs high in NDSF have been used in situations where forage inventories are limited, and can help maintain a healthy fermentation environment. Non-fiber Carbohydrate (NFC) is a calculated (rather than analyzed) carbohydrate component. The most common equation to calculate NFC is: NFC (% of DM) = 100 – Crude Protein (% of DM) – NDF (% of DM) – Ether Extract (% of DM) – Ash (% of DM). Included in the NFC portion of a feedstuff are starch, sugars, and NDSF. As previously discussed, the starch and sugar portions are readily digestible in the stomach of the horse while the NDSF is rapidly fermented primarily in the hindgut. Although the amount of starch and sugar in a feed relative to NDSF can be quite variable depending on type of feed (i.e., hay, pasture, grain-mix), the NFC value is often used as an indicator of the level of starches and sugar in an equine grain ration. This value, however, should be interpreted with caution when a feed contains a high level of NDSF (ex. soyhulls, beet pulp, rice bran). Non-structural Carbohydrate (NSC) is an analyzed carbohydrate component consisting of starch and sugars. The NSC percentage has been the source of much confusion in interpreting analysis results and evaluating carbohydrates in feeds. In the past, the term NSC has been used interchangeably with NFC. More recently, the term NSC has been used interchangeably with starch. Thus, when interpreting laboratory results, it is important to know whether the NSC refers to a calculated “by difference” analysis (NFC) or an analyzed by hydrolytic methods (NSC). 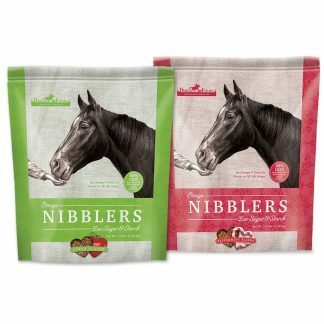 Since some horses can be very sensitive to dietary starch and sugar, the NSC level can be helpful in selecting an optimal feeding program. Starch is a sub-component of the NSC. Starch is determined using laboratory procedures that are not well standardized. The lack of a standard approach to analyze starch increases the variability of starch values within a feedstuff; this problem is most apparent when analyzing commodity ingredients that can contain a number of components that interfere with the starch assay. The variability becomes greater when analyzing a complete feed with various ingredients. Despite this variability, a starch analysis can provide an idea or estimate of the amount of starch in a feed, but can be expensive and is not a routine procedure. One initially thinks of carbohydrates as sugar and starch, yet fiber is the primary carbohydrate providing energy to the horse. The digestive system of the horse was designed primarily for the continual, slow intake of fiber such as grass hay and pasture. Unfortunately, energy obtained from fiber fermentation alone may not be adequate to maintain weight in performance horses or horses with high-energy metabolisms. 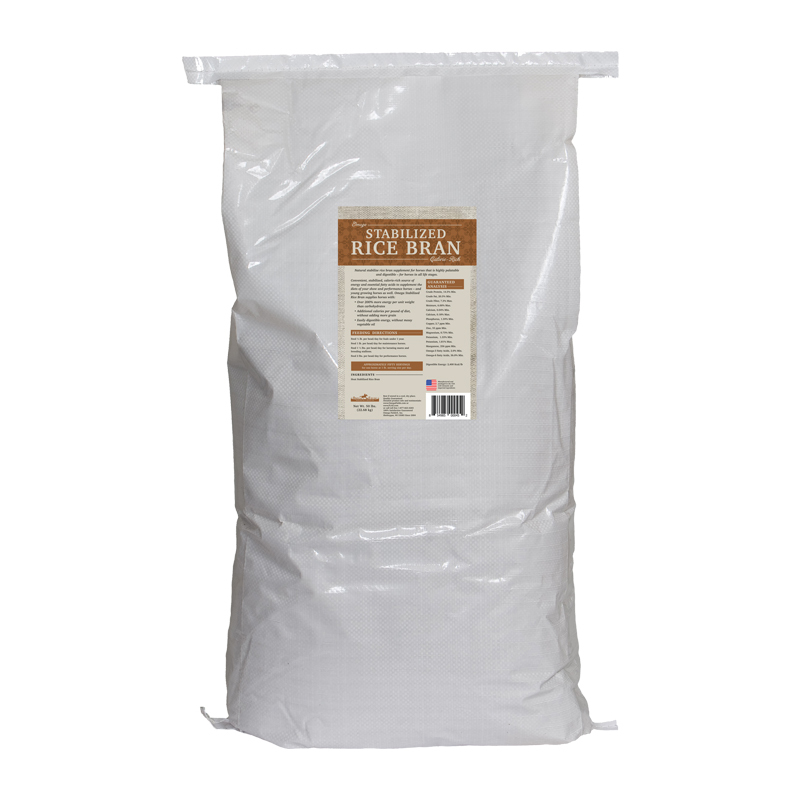 My horse is now on an EPSM diet, and he requires a "quality" rice bran to provide the necessary fat in his diet. He refuses to eat corn oil (can't say that I blame him), so my nutritionist recommended rice bran. I appreciate your assistance. Thank you for your email and your interest in the benefits of our Omega Stabilized Rice Bran for your horse with EPSM. First let’s go over the description of EPSM (with the emphasis on the statement that carbohydrates high in starch should be avoided), then we’ll compare the Non Structural Carbohydrate (NSC) content of Omega Stabilized Rice Bran and Omega Horseshine, look at basic info concerning inflammation, and give our Bottom Line Recommendation. EPSM (Equine Polysaccharide Storage Myopathy) is a muscle condition that results in an excessive buildup of glycogen in the muscle. In the normal horse, glycogen is the energy source in muscle contraction. An EPSM horse cannot complete this process, which results in the excess in stored glycogen. This results in muscle cramps and weakness. As you are aware, the diet needs to be adjusted to decrease the amount of insulin and sugar in the bloodstream. Carbohydrates that are high in starch, such as sweet feed, corn, wheat, oats, barley, rice bran, and molasses, should be avoided and extra calories can be provided in the form of fat. Omega Stabilized Rice Bran is a convenient, stabilized source of high energy and Vitamin E supplement for the diets of show and performance horses, as well as your young growing horses. Omega Stabilized Rice Bran is a rich source of Omega-6 essential fatty acids but it does have a very high NSC of 27% (20.0% Starch, 7.0% Sugar). The stabilized ground whole flax seed in Omega Horseshine actually has a very low NSC of 4.4% (0.6% Starch, 3.8% Sugar). Omega Horseshine is actually recommended for horses challenged with metabolic problems that include EPSM, Insulin Resistance, and Cushings. Note: The stabilized ground whole flax seed in Omega Horseshine also helps maintain proper fluid and electrolyte balance in the small intestine that will lessen the incidence of tying up and muscle cramping. Omega-3 essential fatty acid is a powerful anti-inflammatory and immune builder. The membrane, or outer coating, of every one of the billions of cells in the body are unusually rich in Omega-3 fatty acids. In fact Omega-3 fatty acids are the structural fat that makes up this membrane and play a vital role in how cells function. 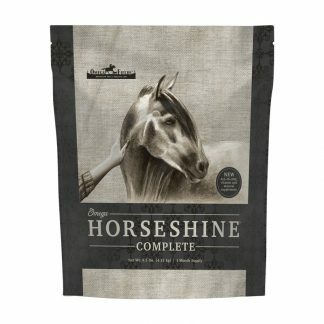 To understand how Omega Horseshine® (as a rich source of stabilized Omega-3 essential fatty acids) helps improve a horse’s quality of life, let’s take a look at how cells behave when they are aging and/or damaged by trauma such as injury, surgery, over-training, allergic reactions, or disease. When a cell is irritated or damaged, or when it begins to age, its membranes break down. As a result, compounds contained within the cell walls are released into the cell matrix. Some of these substances, such as histamine, give rise to inflammation and associated pain. Inflammation is a horse’s natural response to injury. Inflammation is characterized by redness, swelling, heat and moderate to intense discomfort. When a joint becomes inflamed, your horse may experience any or all of these symptoms. If this occurs in joint areas it can prevent the joint from moving properly, leading to stiffness and loss of function. 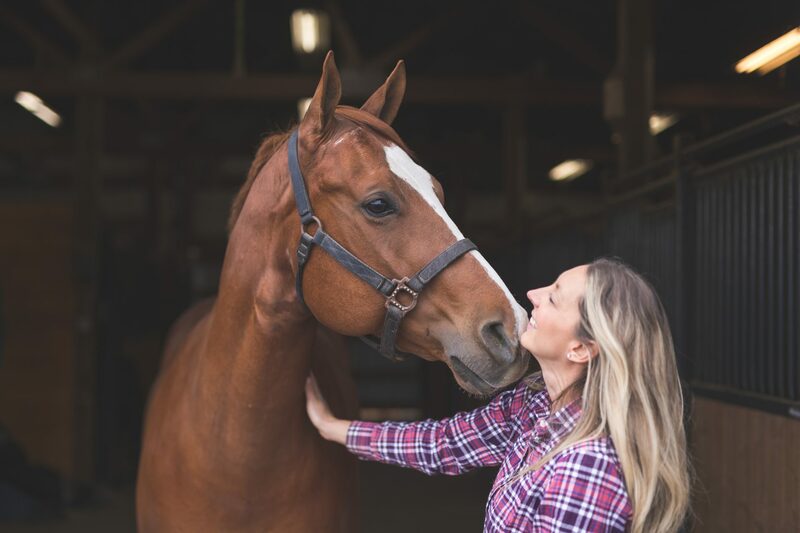 Researchers have found that the “diseases of aging” or “damage by trauma” in horses have similar underlying factors: a decrease in cell stability leading to membrane damage and subsequent release of compounds that promote damage, spasm and inflammation. The Omega-3 essential fatty acids in Omega Horseshine® work by stabilizing the membranes of the cells, promoting healing of existing damage and helping to prevent further damage. On a practical level, this means quality of life is improved, and you will see your horse experiencing freedom from pain. You might want to look at Omega Horseshine rather than Omega Stabilized Rice Bran for a healthy and natural source of good fat for your EPSM horse. One of the safest, most economical ways to add Omega-3 (an essential fatty acid) to your horse’s diet is by supplementing with Omega Horseshine – formulated with stabilized, ground, fortified flax seed. The thing with rice bran is that it is all Omega-6 essential fat with no Omega-3 — that’s why you would definitely want to give more Omega Horseshine if you’re adding rice bran to the diet. It will help keep the ratio of essential fats within the recommended range of 1:1 (Omega-6 to Omega-3) — which is what is recommended for animals and people by the majority of essential fatty acid nutritional experts. If you do decide to go with the Omega Stabilized Rice Bran, we highly recommend that you supplement with Omega Horseshine as well — to help balance the ratio of Omega-3 to Omega-6 in the diet. Please keep in mind that these are only our feeding suggestions or recommendations. We believe it is always advisable to check with your equine nutritionist or your veterinarian concerning dietary changes you are considering for your horses. Why is your Omega Stabilized Rice Bran good to combine with beet pulp? Omega Stabilized Rice Bran is an effective supplement for working/show horses: * DENSE ENERGY SOURCE * NATURALLY RICH ANTIOXIDANTS * EXCELLENT WEIGHT GAIN Omega Stabilized Rice Bran is good to combine with beet pulp: * NO ADDED CALCIUM * GREAT BALANCER FOR CALCIUM-RICH BEET PULP Many equine natural-nutrition experts recommend that horses should eat fats in amounts and types that mimic their ancestral diet. The natural equine diet of fresh grasses is extremely low in fat, with the naturally occurring fat predominantly Omega-3 Polyunsaturated Essential Fatty Acid. The Omega-3 and Omega-6 essential fatty acid ratio in fresh grasses is at 4:1 (Omega-3 to Omega-6). Ground flax seed has Omega-3 and Omega-6 levels that are the closest to fresh grasses. The Omega-3 and Omega-6 ratio in flax seed runs at least 4:1, often even higher. Therefore, we would recommend Omega Horseshine (our award-winning stabilized ground flax supplement) as a healthy fat supplement for your horse — especially if you’re going to feed rice bran (which is very high in Omega-6 essential fatty acid). Omega Horseshine will help balance the essential fatty acids in the diet to bring them in closer ratio to the natural diet in the wild. Can you feed rice bran to horese suffering from Insulin Resistance or Cushings? Although rice bran and rice bran oil may be super sources of fat (much safer than other grains) and contain powerful antioxidants — they would thest high in NSC (non structural carbohydrates) for starch and sugar because rice bran is naturally high in NSC. Therefore, rice bran or rice bran oil would not be recommended for IR or Cushings horses. We have 6 horses and except for our 24 year old thorougbred all are happy and in excellent weight. With our thoroughbred we have had problems for several years keeping weight on him. He seems to do well in spring with fresh baby grass, but summer comes and he seems to get thin. We have tried oils, various weight building supplements with really no success. Until I found the stabilized rice bran, he finally seems to be gaining weight. Thanks fora great product, even better he likes it.